A new method of teaching has come on the scene called Flipped Classroom. Quite simply, a flipped classroom delivers part of the instruction online outside of class and homework or hands-on work is done in the classroom. Students have more control over their own learning. Many teachers have already been using this method but didn't have a name for it. Students watch lectures at home by viewing videos on websites such as TED.com, Khan Academy, or YouTube. They may also communicate with each other and the instructor through chatting software or in comments sections. Supporting instruction can be done on Powerpoint , and with websites using Prezi, SlideShare, and Vyond. How did it all begin? In 2007, two teachers in Woodland Park, Colorado, Jonathan Bergmann and Aaron Sams, used software that records PowerPoint presentations to record their lectures and post them online for students who missed their classes. These teachers were then asked to speak across the country about their methods. The idea began catching on and teachers began using online videos and podcasts more and more with their students. They also discovered that student motivation and interest began soaring. Many alternative schools have been using this model for over a decade. Some alternative schools allow students to pick their hours and use software that advances at the individual pace of the student. Those who have adopted the Flipped Classroom generally create at least three videos a week. These videos usually are around five to ten minutes and can be watched at home, or in school if they don't have internet access. While in the classroom, students are spending time doing labs, interactive activities, or working on homework while receiving help directly from their teacher. The advantages of the flipped classroom include students receiving instant feedback on difficult concepts, choosing their own hours to work around their schedules that may include sports, and the ability to revisit videos and concepts that are difficult. Students are given ownership and responsibility for their own learning. Students come to class with prior knowledge and are ready to learn. Teachers can work with students one-on-one or in small groups. With additional links, students have the ability to pursue a subject beyond what the class requires. The disadvantages of a flipped classroom include the fact that the teacher must have careful preparation. Recording lectures take time and all online materials must be available in one place for easy access by students. Teachers who use this method also must be very adapt at technology. Not all students have internet access at home, so accommodations have to be taken into account. Students who do not complete the videos or study at home may come to class unprepared. Because more and more students now have smart phones, they can also do their courses on their cell phones. They can watch the videos using various video apps and many schools now have their own online learning systems that are mobile phone friendly. Some would say that the arts have always put students in charge of their own learning. Art teachers are critical in facilitating the process of exploration and skill within their art. The difference is that the set-up for the lesson is a video(s) placed online for the students to view. Some teachers are using IAD in their flipped classrooms. For example, the color symbolism page has many student comments on the bottom. Students ask questions about the material on the page in the comments sections. Why not try this in your own classroom? Record your PowerPoints and yourself giving a lecture and post them online for your students to view at home? Students who don't have internet access can view the videos in a computer lab at school or in your own room while you help other students. You can then spend all your time in class working one-on-one or in groups with your students. They can focus on art production and get more accomplished. Have fun! 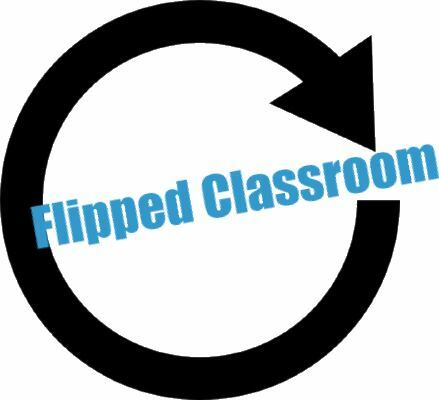 The Flipped Classroom - A PDF from TechSmith on an entire district flipping. Exploring the Flipped Classroom - A PDF from TechSmith shows you how to get started. Flip Your Classroom: Reach Every Student in Every Class Every Day - It started with a simple observation: students need their teachers present to answer questions or to provide help if they get stuck on an assignment; they don't need their teachers present to listen to a lecture or review content. From there, Jonathan Bergmann and Aaron Sams began the flipped classroom-students watched recorded lectures for homework and completed their assignments, labs, and tests in class with their teacher available. Flipping 2.0: Practical Strategies for Flipping Your Class - If you've decided to flip your class, you probably have new questions: How do I do this? What will it look like? What will students do in class? How will I create learning experiences for students outside of class? What have other teachers done? What are Teachers Saying About the Flipped Classroom? "I was discussing the use of technology in the classroom with fellow colleague of mine. She is also a sixth grade teacher as well as a tenth grade AP History. Fortunately she utilizes podcasts as well as audio recordings for her students in a flipped classroom model. One of the main reasons for this flipped model is that this course is also a distance learning course. Unfamiliar to some schools, this course is able to be broadcast live to a neighboring school through the use of a camera and microphone. In essence, this teacher is teaching two classrooms full of students during one class period. Yesterday, I had mentioned that electronic devices are hard to come by within our district. Although not having the ability to use this in my classroom, I do see the benefits of differentiating instruction for those students that learn better in this manner. It is interesting to see the use of technology being used to help students to the fullest, even if it is not possible in your own classroom." "In discussions with the colleague of mine that uses components of the flipped classroom, she has voiced the advantages as well as disadvantages. One of the disadvantages that she expressed was students not completing the assignments or listening to the lectures on the podcasts or online." "On the other hand, I would like to begin incorporating components of a flipped classroom in my instruction. However, due to the curriculum changes that my district has made, I am not sure if this is possible while utilizing the mathematics modules. Do you have any suggestions of how to begin incorporating a flipped classroom in instruction?" "The facility where I teach right mainly used the flipped classroom model last year and from what I have heard, many students did not do the work; they would be online surfing the net or doing other things besides what they were supposed to be doing." "It's commendable that you are trying something new with your class. Maybe you can start with short lessons/podcasts and then build up from there; continue to do part of the lesson in the traditional manner and then sometime during the class, introduce the flipped model and keep adding on until the students are comfortable. It is important for the students to understand the expectations as they might take the podcasts lightly - maintain the high expectations regardless of what model is being used." "I really enjoy the flipped classroom model. I have been working on preparing lessons to record over this 2 week break. I plan to start on doing just 1 per week that is required and 1 that will offer extra credit to students. This will allow me to see several things: 1. how many students have access at home; 2. how many students actually complete the lessons; 3. are they able to understand the lessons and create good questions from what they see; 4. do I have parent buy-in for what they might consider more homework for their students." I love the idea of the flipped classroom for more than just freeing me up to work individually with students each day. It also allows absent students to keep up with instruction. With as fast paced as our courses are, it is often difficult for students to get all work made up and understand what they have missed out of every class when absent for more than a day." "Students have to be very disciplined in order to be successful in this type of classroom. Unfortunately, many middle school students are not at the discipline level needed for this to work. A couple of years ago I was teaching two simultaneous units because of a time crunch to prepare for testing. One topic we were covering in the classroom and one was an independent study that was completed outside of school. I had lessons posted online with activities, presentations, movies, etc. to support student learning. Many of my students did not complete this study and we ended up having to cover it in class anyway." "I find the same problems with my students. I hate assigning homework just for that reason. What I have found is that my students would rather give up lunch with their friends to work on stuff. Once a week I offer the students a chance to come up to my room for lunch and we will work on their outside work." "Another thing I have found that middle schoolers love is knowing that you are in the same boat. If I tell them what I have to do for homework that night, they are more apt to do the work. They realize that I am not asking them to do something that I won't do."